Suzanna Hamilton’s first impression of Ronald Fraser was that, ‘he was quite nice but v.fussy.’ It seems to me that he loved three things: acting, ladies and laughter. Whilst he had a small mouth his capacity for alcohol of almost any kind was legendary. Funnily Enough this was the day that we all had a drink on set. The clapperboard or slate had snapped shut on the 500th shot of the movie and in, line with tradition, a bottle of champagne was cracked open. Somehow I managed to end up with the dregs. I thought them utterly delicious. I’m not sure exactly what was going through Ronnie Fraser’s mind at this point but Denis Lewiston has a call sheet in one hand, so must have still had his mind on work. I think we’d reached the end of a pretty good day. The fishing rod was such an excitment. Simon West was very generous and let us all catch fish with it. Arthur Ransome would have been proud of him. Suzanna refers to the 500th take, but she was mistaken. We rarely took more that 3 takes of each shot. It was the 500th slate. It doesn’t seem much to me now. I went on to work on drama serials with so many episodes that they would have amounted to films four or five hours long. I remember operating the clapper-board on this occasion because the entire camera crew were involved in pulling off a 360 degree shot, the cameraman Andrew Dunn up on a crane while a stiff wind was blowing, but that’s another story. I was just the girl saying, ‘Shot one thousand and forty-nine, take three.’ Quite fun. 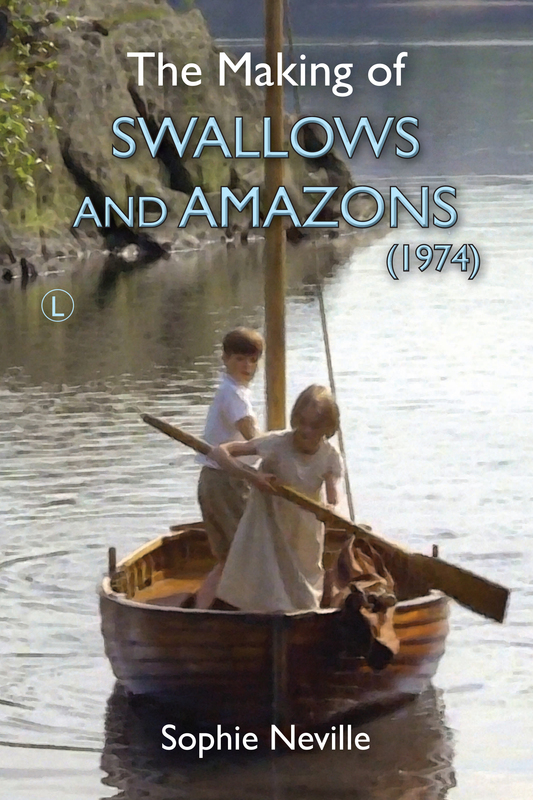 Did appearing in ‘Swallows and Amazons’ inspire me towards working on a film crew? No, at the time the hanging around aspect of filming bored and frustrated us children. Later, when I did work on productions, any time I was able to relax on set was treasured, absolutely relished. I was an assistant director with a Motorola on my hip and rarely had a chance to take the weight off my feet. I have just watched the scene shot in the cabin of the houseboat and have noticed an odd thing. We have a travelling chest of drawers exactly like Captain Flint’s and I set a mirror on top of it just as Ian Whittaker the set-dresser had. One secret of the scene is that, once we start to clap and sing, ‘What shall we do with the drunken sailor?’ Claude Whatham, the director shouted, ‘Go round’, not once but twice. If you listen very carefully you can just hear him the second time. He wanted us to dance around the room. I knew this but couldn’t move much with the parrot, so went up and down. Kit Seymour was absolutely boiling in her red bobble hat and no on else could move much for fear of knocking the furniture. It was left to Suzanna to dance about – a tricky thing to do without seeming self conscious. All in all I think we needed a glass of champagne by the end of that day.